Rand Paul, generally considered to be a leading thinker in the Republican party, is now also an education expert. In other words, Paul’s innovation is the lecture. It may be recorded, distributed digitally, possibly with better graphics. But still a lecture, representing the centuries-old concept of learning as the one-way transmission of information from an expert to the student. From the latest edition of the Freakonomics Radio podcast, titled Think Like a Child, this exchange between the host Stephen Dubner and Alison Gopnik,Â professor of psychology and philosophy at the University of California at Berkeley. They’re discussing the differences between the way young children and adults learn about the world. DUBNER: Implicit in that is while we have this strong set of priors, right, prior beliefs that we act on. And also implicit in what you’re saying is we have a lot of heuristics, we have a lot of shortcuts that we’ve learned work well enough, and so we do them always, right? GOPNIK: Exactly. Let me give you an example in the universities for example. It’s a good example, my world. Â We give lectures. And the origins of that are the days when there weren’t printed books, so you had one manuscript and the professor was reading from the manuscript because the students didn’t have books. It is literally a medieval instructional technique. But we’ve been doing it for hundreds and hundreds of years. It’s kind of what you do when you’re a faculty member. And the fact that we have no evidence at all–in fact, we have some evidence to the contrary–that this is a good way to get anybody to learn anything, doesn’t keep us from doing it. Mostly we’re doing it because we’ve always done it. I’ve stashed that phrase “medieval instructional technique” away in my notes for later use. I think what they say is, ‘Well, we’ve kind of always done it, and it seems to work OK, and we’re good at doing it.’ And I think, here’s the most relevant thing: It would take so much work to try and think through all the alternatives, and try them out and see which ones work and which ones don’t. That would just be such an effort that, even if maybe in the long run it would be a bit of an advantage, in terms of my short-run utilities, and in particular, just for me, it’s not going to make a difference. Think about it. That whole paragraph could describe the American education system, even after the reform efforts of most politicians and billionaires are applied. I really hate when popular media report research findings with headlines like this: “Students’ use of laptops in class found to lower grades”. Too many people won’t get past that blanket statement, never questioning the kind of superficial research behind it. For the study, published earlier this year in the journal Computers & Education, research subjects in two experiments were asked to attend a university-level lecture and then complete a multiple-choice quiz based on what they learned. The results were pretty much what you might expect. 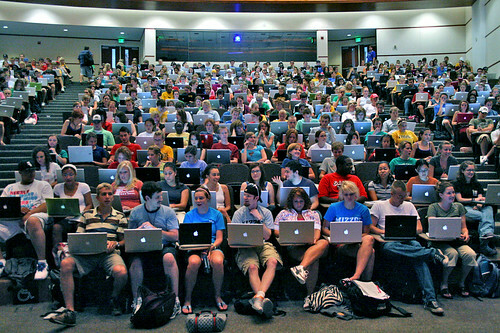 Those students using laptops to take notes who were also asked to “complete a series of unrelated tasks on their computers when they felt they could spare some time”, such as search for information, did worse on the quiz than those who didn’t do any of that stuff. In a second part of the experiment, those who took paper and pencil notes while surrounded by other students working on computers did even worse. Of course, the implicit assumption here is that lectures are an important vehicle for learning, not to mention that a multiple-choice quiz is a valid assessment of that learning. And that use of the technology was the primary factor in the low scores. I wonder how the results would have differed if the researchers had divided the subjects into two groups, those who were interested in the subject matter, and those who could care less and only were participating for the twenty bucks. Ok, without any kind of research to back it, I’m going hypothesize that the single biggest factor in student learning is some kind of connection to the material. With or without a laptop. At the risk of being declared obsessive, I have one more rant about the educational philosophy of Bill Gates based on the Fast Company interview with him. This time, his vision of that classic instructional tool: the lecture. That’s one more goal: to revolutionize the lecture in terms of cost and quality. The idea that you can store video essentially for free should mean that anyone can watch the best lecturers in the world. Rather than a student getting one of 3,000 people across the country who try to teach beginning physics or statistics or remedial math, through a process of comparison, competition, and improvement, you get someone who is pretty special and has the budget to do something fantastic. Lectures should go from being like the family singing around the piano to high-quality concerts. Transform lecturing by giving them better production values. The high-budget video of a concert may look and sound better, but you’ll probably learn more about music by actually singing with your family around the piano. I’m betting Gates didn’t learn computer programming by watching someone talk about.